There is nothing like the appreciation and gratitude of a well entertained audience. Either as a soloist or part of a 400+ piece ensemble setting, to perform music to the best of your ability, especially as part of an ensemble, is a unique and personal satisfaction. When you come across any opportunity to perform, grab hold of it and see it through all rehearsals to its culmination with the applause of the audience. Do this, even if you don’t know what you are signing up for, like when I was told about the Gothic Symphony production in 2010. Read my Gothic Tuba Experience, which is about something I never knew about through to the most unique musical time of my life. There have been far too many performances since starting the tuba, to be accurately listed here. The following is a summary of ensembles and key performances throughout the years. 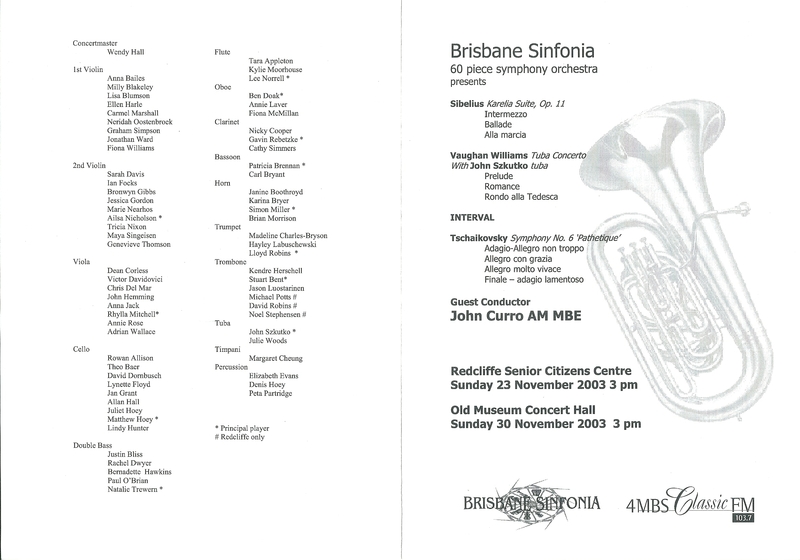 Program from 2003 Vaughan Williams Tuba Concerto concert. Once a month, nursery rhyme tunes are performed to accompany the “Story Time” session as part of the Maleny library’s kids activities. Plus various tuba quartet, brass quintet, brass and wind ensembles over the years.